The fourth in a series of successful short-term themed exhibits, Walk Like a Penguin educates New England Aquarium visitors about everyone’s favorite tuxedoed birds. Aquarium visitors will learn to walk like a penguin, try to talk like a penguin, and discover why they definitely do not want to eat like a penguin. Visitors are provided with a free penguin passport, which they use to travel along the Penguin Path and learn how penguins eat, swim, communicate and much more. Each stop along the Penguin Path includes an interpretive panel and a small stamping station where visitors can stamp their passport to record their journey. 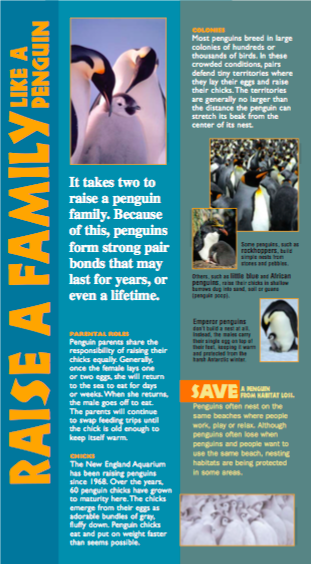 Walk Like a Penguin features eight interpretive panels, each of which exploers a different aspect of penguin biology, ecology or conservation. 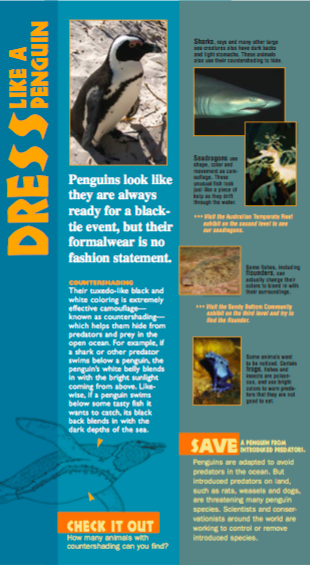 Each panel explains how penguins accomplish a task, such as keeping warm, and contrasts penguins’ techniques with those of other animals. In addition to the interpretive panels, Walk Like a Penguin features eight stamping stations, each of which includes a panel with a short question geared towards younger visitors. Each stamping station panel challenges young visitors to accomplish a task—walk, eat, swim, etc—like a penguin, helping children and their parents better understand just how different penguins are from people. 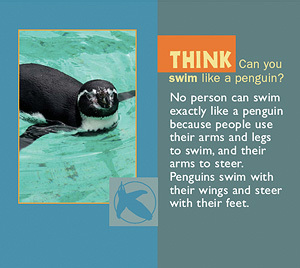 Walk Like a Penguin encourages visitors to explore how the adaptions that penguins use to survive survive are also used by other aquatic animals. 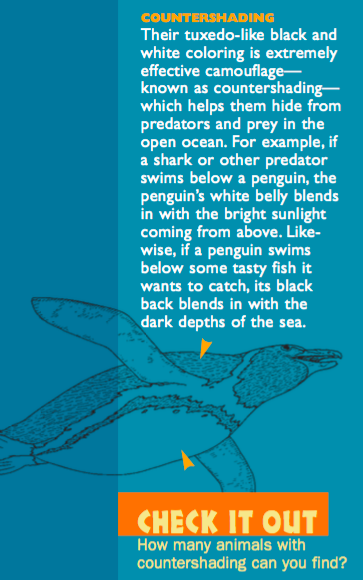 From insulation to locomotion, penguins share surprising similarities with fur seals, sea turtles, sharks, and more.